A kind-hearted Samaritan sees the poor man who had been robbed and beaten, and stops to help. ESUS KNEW THAT he had not much longer to preach, for the time was near when he must lay down his life for the sins of the people. He therefore chose seventy other men who had followed him and received his teachings, and to them he gave power to heal the sick and to cast out evil spirits. Then he sent them out, two and two, into the country east of the Jordan River, to preach in the cities and villages where he would go later on. And just as the twelve disciples had gone, so these men went forth to heal the sick and to tell people that the kingdom of heaven was coming near to them. And when their errand was finished they hurried back to Jesus, telling him that even the evil spirits obeyed when they commanded them to depart. These seventy disciples rejoiced much because they have received power to command evil spirits to obey them; but Jesus said, "Do not rejoice in this, but rather be glad because your names are written in heaven." Then Jesus prayed to God, the Father, and afterwards he turned to his disciples and said, "Blessed are the eyes that see the things you see; for I tell you that many prophets and kings desired to see the things which you see, but they did not see them, and to hear the things which you hear, but they did not hear them." Then a wise Jew, called a lawyer, came to Jesus and asked a question, wishing to tempt him. He said, "Master, what shall I do to inherit life in heaven?" Jesus knew this man had knowledge of the law of Moses, so instead of answering the question he asked the wise man another. He said, "What is written in the law of Moses? Do you not know its teachings?" The lawyer replied, "Moses wrote that we should love the Lord our God with all our heart, and with all our soul,, and with all our strength, and with all our mind; and he wrote that we should love our neighbors as ourselves." Jesus said, "You have answered right; do this and you shall have life in heaven." "One day a man started to travel from Jerusalem to Jericho. As he went along the lonely road he met some robbers. These men stopped him, took away his money, tore off his clothing, and beat him until he was half dead. Then they ran off, leaving him to lie by the roadside. "Presently a priest came along the road, and he saw the poor man lying there. But he did not stop to help the stranger. He did not even speak to the poor man and ask if he might send some friends to aid him, but passed by on the other side of the road. "After the priest had gone by a Levite came by. When he saw the poor man he also took no second look. He did not offer to help him. He hurried on his way leaving the poor man to die. 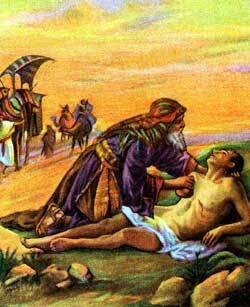 "And no doubt the poor man would have died if a kind-hearted Samaritan had not come along the road soon afterwards. When he saw the poor man he stopped his mule, climbed out of his saddle, and bent over the stranger to speak to him. He saw that the wounded man was a Jew, and he knew the Jews were not friendly to the Samaritans, but he knew this Jew was in deep trouble. So he poured oil upon the wounded places and bound them up. Then he gave the wounded man a drink to revive him, and helped him to climb into the saddle on his own mule's back. "Now," asked Jesus of the lawyer, "which of the three men was a neighbor to the one who was attacked by robbers?" "The man who treated him kindly," answered the lawyer. Jesus said, "Go, and do as the Samaritan did."